So, you need a piece of glass for your home or business? Great, we’re here to help! Springfield Glass Company has exceptional options for custom-designed glass. One of the elements you’ll be able to pick for your glass is the type of edge you want to meet your design vision. If the edge of your piece will be seen, edge treatment will have a great effect on the feel, appearance, and usability of your glass. Read on in today’s blog from Springfield Glass Company to learn about the glass edge types you can choose from! This will be a scored and snapped edge. It will be sharp and difficult to handle safely. It may have chips and rough edges. We don’t recommend this edge for direct use by our customers. This is where we sand the cut edge to create a slight chamfer on the top and bottom edges of the piece to make it smooth and safer to handle. This edge will have a nice appearance and will not have chips or rough edges. 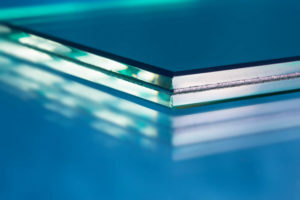 This is the most common edge treatment for non-tempered glass. This will be similar to the shop seamed edge but it will be done by a machine in a fabrication plant. This edge will be safer to handle than a cut edge but may not be suitable for exposed viewing the way a shop seamed edge is. The primary purpose for this edge is to prepare the glass for tempering, not to improve appearance. This is an edge with a nice, uniform, shiny appearance. It will be smooth and safe to handle. The top and bottom edges of the piece will be chamfered to remove sharpness, resulting in a three-sided edge that has all surfaces polished to a shine. It is decorative and pleasing to feel and look at. This is the most common edge treatment for tempered glass products that will have exposed edges. This treatment is similar to the flat polished edge except that its overall shape will be like the round edge of a pencil split lengthwise. This is the smoothest edge and has a very nice appearance. This process grinds away and polishes a part of the face of the glass to provide a beveled surface along the top where it transitions to the edge. The beveled edge is very decorative and is most noticeable from the face of the glass, whereas the other treatments are only visible from the edge. The width of the bevel can be selected to match the desired effect and the thickness of the glass; typically, from one-half inch to one and one-half inches. Beveled edges are most commonly used on table tops and mirrors. Contact Springfield Glass Company Today! At Springfield Glass Company, we have many capabilities for glass edging, and these are just a few of the edge treatments available. Contact Springfield Glass Company to discuss other options and let us help you design your glass to match your vision. Give us a call at 417.883.6555 or send us an email at info@spfdglassmo.com.